Panasonic DC-GF10/90, GH5S, GX9, TZ200/ZS200, G9 in high-res mode. 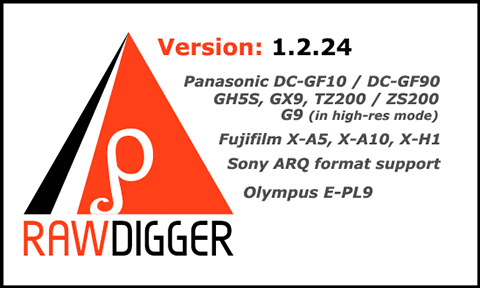 If you are using RawDigger for 2+ years, please check the setting for maximum pixel count in RawDigger Preferences - "Display options" - "Disable RGB rendering for files larger than...". Currently the recommended value is 120 Mpix, assuming you use 64-bit OS and 4+ GB RAM. You may still have it at the smaller, pre-2016, value of 40 Mpix, since we preserve the settings when updating; while 40 Mpix setting is not sufficient for recent high pixel count sensors.